Profile: Frank Black is Millennium’s beacon of hope. In a world tainted by moral bankruptcy, tormented by eldritch evils and teetering on the verge of apocalyptic meltdown he is our best line of defence. He knows evil having seen the world through the eyes of killers, and yet time and again he emerges from his visions triumphant and catches the bad man. Yet Frank has been taunted for so long by the Polaroid Stalker’s missives that have repeatedly threatened to break the sanctity of his yellow house and to harm his family. 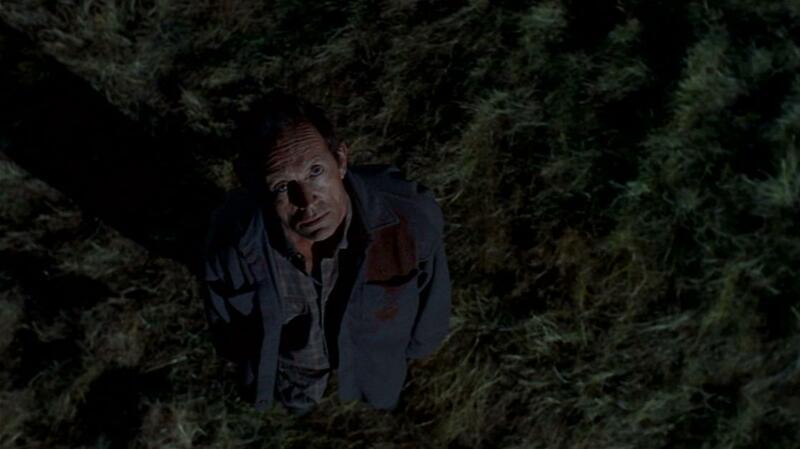 Back home after the fruitless search for Catherine following the Polaroid Stalker’s kidnap of her and escape from Tacoma Airport, Frank asks Peter what he needs to sacrifice in order to get Catherine back. From his words and subsequent actions it is apparent he is willing to sacrifice at the very least his own liberty, if not his life. Having surmised the Polaroid Stalker’s location, he ignores Peter Watts’ plea to wait for backup and instead makes the decision to go there alone and armed. Finally confronted by the man who has taken his wife captive, his poise explodes into a few moments of devastatingly visceral violence, and he repeatedly stabs the man until he is dead. But for the Millennium Group’s further interference, he would not so readily have evaded being called to answer for the killing. Even in the wake of her rescue, Catherine is left feeling conflicted from having witnessed Frank’s violent actions from such close quarters, telling him, “I don't know yet if it was wrong, what you did.” “Neither do I,” admits Frank. And neither do we, the audience, even as we are forced to consider how we might react if our most loved ones were under such threat. Plenty of portrayals of such an act of vengeance would leave the audience with no doubt as to the moral righteousness of the hero but, quite apart from his statement, the line walked by Frank Black’s character in this episode is a fine one. As Lance outlines in the documentary accompanying the Season Two DVD release, “Every action has a reaction, so no matter how pure of heart you might have been about something, you’re gonna pay the consequences, or pay for it. The truth definitely shouts. It set me out on my own.” It was a brave move to take the series’ protagonist and transform his behaviour in this way as part of its reinvention of the series, and one that might easily have gone awry. 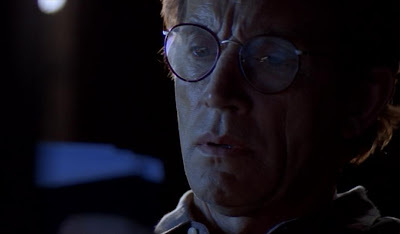 But as John Kenneth Muir noted in his recent article on “The Tao of Lance Henriksen”, Lance embodies the very soul of the roles he undertakes, “without standing back — away from the performance — and transmitting some sense of moral judgment”. In a less nuanced or more straightforward performer’s creative grasp, Frank Black’s actions in “The Beginning and the End” might well have felt forced or untrue to the character by trying too hard to sell the audience on the righteousness of his revenge. As it is we believe Frank’s transformation and, as he drives away from his yellow house alone at the end of the episode, we continue to want to follow this complex hero on his journey through the dark. There are a multitude of reasons why, thirteen or so years later, a legion of fans still stand firm in their resolve to return Frank Black to our screens. 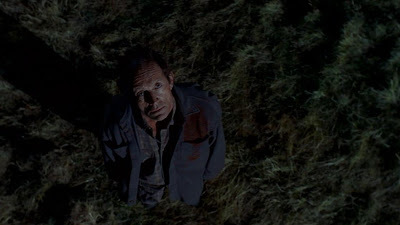 There is the initial creative vision of Chris Carter, the subsequent involvement of some of the very finest writers, directors, cinematographers and editors working in television throughout its three year run all contributing to a superlative body of work, but above all there is the one constant: Lance Henriksen’s unique interpretation of the role. For those of us well acquainted with Frank Black, Lance so inhabited the character that it seems inconceivable that anyone else could have played him, as the executives at FOX originally requested. Evil has many faces. Hope has just one. And, thanks to Lance, the world still needs Frank Black. 5 Responses to "What the Killer Sees: Frank Black"
Lovely article Adam. I enjoyed that with scones and tea! @Joe: Many thanks for that, and I hope you enjoyed "The Beginning and the End" all over again; it's a fine instalment and quite the statement of intent for the journey that Season Two took us on. Congratulations too on the release of "Not Bad for a Human" - I can't wait to read it! @James: Cheers, m'colleague. Now what have I told you about reciting my blog posts at your naturist tea parties? Enough already! I loved this post. I've followed this series ("What the Killer Sees") for some time, and enjoyed every installment. How ironic and weird that Frank Black should be added to the list. 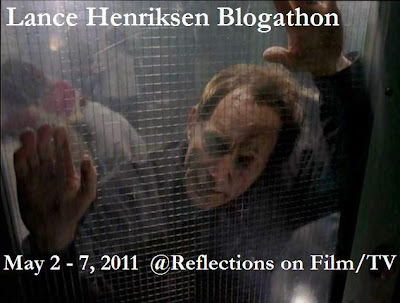 This was a perfect addition to your series of articles, and also a really awesome inclusion for the blogathon. Thanks so much, John. It did feel a little perverse to be writing about Frank for this column, but a good fit for the blogathon nonetheless. It goes without saying that your support and kind words mean a great deal, and I was proud to be a small part of what was a truly great week boasting a wealth of material. Kudos really goes to yourself and Joe for hosting it and ensuring it was such a success, so many congratulations on that. "Not Bad for a Human": Order Your Copy Now!